Tahoe, from the family of best-selling full-size SUVs, offers best-in-class highway fuel economy of 23 MPG, along with striking good looks and powerful capability, it’s easy to see why. Tahoe features a 5.3L EcoTec3 V8 engine designed to generate the power you need while offering better fuel economy than any full-size SUV in the industry. Why settle for performance or efficiency when you can have both? A light weight suspension helps optimize fuel economy while still being stiff enough to maintain the excellent ride Tahoe is known for. 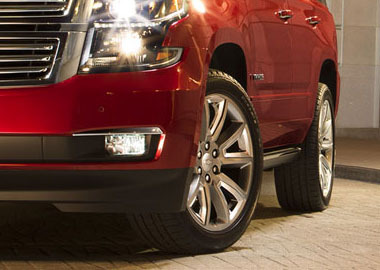 Along with a superior ride, Tahoe offers a maximum towing capability of up to 8,600 lbs. – plenty of power to tow boats, ATVs and whatever else you want to bring along. Available 22" wheels and retractable assist steps. Projector-beam headlamps and HD LED taillamps on Tahoe LTZ. 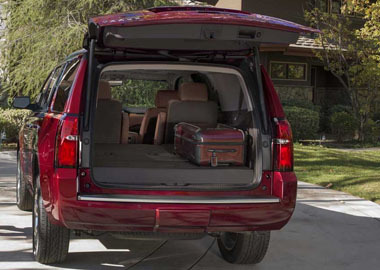 An available hands-free programmable power liftgate can be opened with a gentle kicking motion. Inside Tahoe, the center console is large enough to fit a laptop computer, and the 8-inch diagonal color touch-screen slides up to reveal a lockable space to help secure your valuables. With available power-release second-row and power fold-flat third-row seats – the fastest of any competitor – Tahoe offers up to 94.7 cu. ft. of cargo space. Creating a quiet cabin was a major focus, which is why Tahoe features an acoustic-laminated windshield and triple-sealed inlaid doors to help reduce outside noise. Additional exterior/interior dash insulation and a thicker floor barrier in critical areas isolate exhaust and underbody noise. Tahoe offers ingenious technology to simplify your life, like support for Apple CarPlay™, a smarter way to use your iPhone with the Chevrolet MyLink display. And with the new available 8-inch diagonal Reconfigurable Cluster with Driver Information Center and Head-Up Display, you’ll have easy access to all the information you need. Bring your technology with you and stay fully charged with 13 charging locations, including up to 6 USB ports, a 110-volt three-prong outlet, and an available wireless charging station. Put information and entertainment a touch away with the Chevrolet MyLink display, which features an 8-inch diagonal color touch-screen that you can customize with the options you use most. 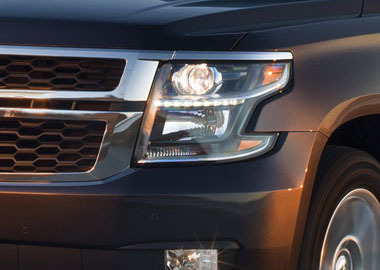 Tahoe offers a host of available advanced safety features to help prevent a potential collision, and technology to help protect you and respond in the event of one. Meanwhile, an available Theft Protection Package can help keep your belongings secure inside your vehicle. As your comprehensive owner benefit program, Chevrolet Complete Care ensures our commitment to owner satisfaction for all 2016 Chevrolet vehicles.